This million dollar Sunriver home Includes: Full Size Billiards Table / Private Hot Tub / AC / SHARC Passes / Wi Fi / Free Movies / Free Video Games / 60" HDTV in Living Room / River Rock Fireplace / HD TV's in every room / Keurig Coffee Brewing System / 9 Bikes / Ping Pong Table / Much More! WELCOME TO CASCADE LODGE! Come relax in this premium five star vacation home! This luxurious 3700-square foot custom lodge-style home is the perfect place for your next Sunriver get-a-way. Features Include: Air Conditioning / Private Hot Tub / Custom Log Accents / Beautiful interior design and furnishings by Mountain Comfort / 60" HDTV / Spectacular Kitchen with solid granite counter tops and island / Custom Hickory Cabinets / Double Oven / Stainless Appliances / Full Size Billiards Table / Ping Pong Table / 9 Bikes / Webber Gas Grill / 14 Unlimited Use Owner Passes to SHARC Water Park & Sledding Hill, and all Tennis & Pickle Ball Courts / High Speed Wireless Internet / Blue-ray player / Free Movies / Free Video Games / Much More! Seven magnificent bedrooms, including two Master Suites, and five spacious bathrooms. 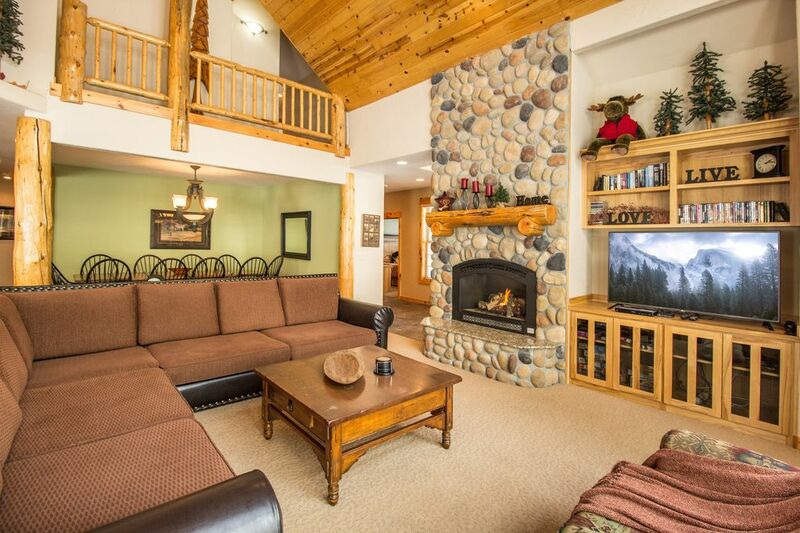 Great Room has a gorgeous river rock fireplace, 20' vaulted pine ceilings, view windows throughout and comfortable seating for your entire group to relax. Two dining areas with seating for up to 18. This house was designed with large groups in mind. Great for family reunions, wedding parties, couple groups, professional retreats, golf groups, conferences, church groups, or multiple family vacations. Located at #17 Shagbark this home is convenient to all Sunriver amenities including, Woodland's Golf Course, SHARC, Tennis Courts, Grocery store and more! We also own 4 other homes in Sunriver: VRBO#49784, VRBO#153892, VRBO#34625, and VRBO#1213224. All of our homes have a 5 star rating and feature Hot Tubs, Free SHARC Passes, Bikes, AC, Free Wi Fi, Free Movies, Free Video Games and so much more. Great for family reunions, business retreats, church groups, golf groups and more. *Great Location Just off Cottonwood Rd. Our family loves staying at Cascade Lodge! It works out great for large groups, giving everyone plenty of space. When you walk through the front door there is plenty of "Wow Factor". The living room is open and full of light with large floor to ceiling windows. The huge log beams throughout, and the beautiful river rock fireplace, make Cascade Lodge warm and inviting. The kitchen is a chef's delight with just about everything you could possibly need for that big group meal. The Pool Table, Ping Pong Table, Bikes and Video Games keep everyone engaged for an exceptionally fun vacation. The Private Hot Tub is also a great place to relax at the end of the day. The 60" HDTV is a big plus for watching sports and movies. We even provide lots of DVD movies! What a house! Plenty big for our 3 families with tons to do and a lot of the little touches well thought out. We started to coming to this property 9 years ago and it just keeps getting better and better. Ron maintains the property wonderfully. New ping pong and bikes. this year! Wonderfully stocked kitchen. The memories and great times we've had here you can't put a price on. I am so thankful for Ron - he's always responsive and supportive. We hope to return for years to come. Thank you Ron! The home was prefect — clean, well stocked, very accommodating for our large group. Ron was quick to respond and easy to work with. We love Sunriver and weren’t disappointed in any way! Had a most fantastic 3 night stay. Warm and inviting place with a great landlord. Has more than everything you could need. Great place for a large family get together, kid friendly and kitchen is well stocked. Had a wonderful time, the house was fully stocked, comfortable and perfect for our group of friends. Thank you for sharing your home with us! SHARC Water Park, , 31 Tennis Courts, 8 Pickle Ball Courts, 30 Miles of Paved Bike Paths, Walking Paths, Two Championship Golf Courses, Sage Springs Day Spa, White Water Rafting, Canoeing, Ice Skating, Miniature Golf, Bumper Tubes, Train for Tots, Bounce House, Slides, Bungie Jumper, ATVs, Mopeds, more!